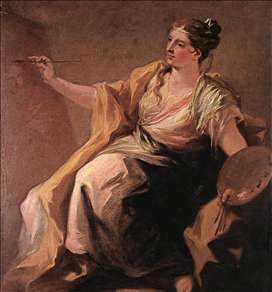 Venetian decorative painter, who was a pupil of Sebastiano Ricci and one of the most important of Tiepolo s predecessors. Like Pittoni, he worked for many foreign patrons and travelled widely. He was first recorded as a painter in 1703 and soon after this he married the sister of Rosalba Carriera, who mentions him in her diary on several occasions. In 1707 Lord Manchester went on an embassy to Venice; he commissioned a picture to celebrate the event from Carlevaris and brought Pellegrini and Marco Ricci back to London with him in 1708. Pellegrini soon had considerable success and became a Director of Kneller s Academy in 1711. Vertue says that Pellegrini painted prodigious quick, had a very noble and fruitfull invention which may be seen in the decorations at Kimbolton Castle (now a school), done for Lord Manchester, or in the decorations at Castle Howard (1709, mostly destroyed in 1941). 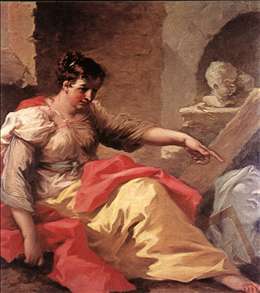 In these decorative series Pellegrini shows that he was a true precursor of Tiepolo in the lightness and gaiety of his touch which contrasts with the duller history painting of Pittoni. In 1713 he went to Germany and Flanders; returning to England in 1719 when, according to Vertue, he was less successful because Marco Ricci had sent for his uncle Sebastiano, who was generally agreed to be a better painter. Pellegrini also painted a splendid ceiling for the Bank of France (since destroyed) in Paris, decorated the Great Hall in the Mauritshuis in The Hague (1718), and worked in Prague, Dresden and Vienna. There is a sketch of 1710 in London (Victoria and Albert Museum) which may represent his design for the cupola of St Paul s for which, according to Vertue, he made several designs and a moddle for painting the Cupolo at St Paul s for which he was paid tho he had not the cupolo to paint . There are works by him in Barnard Castle (Bowes Museum), Berlin, Birmingham, Boston, Cleveland Ohio, Dresden, Dublin, The Hague, Leeds, London (National Gallery), Oxford (Ashmolean), Paris (Louvre), Toledo Ohio, Vienna and elsewhere. See more details about "Allegory of Sculpture"
See more details about "Allegory of Painting"